At the service of thanksgiving and celebration of Ian’s life, we spoke of Ian’s life as a rich tartan with its foundation colour being his strong Christian Faith. 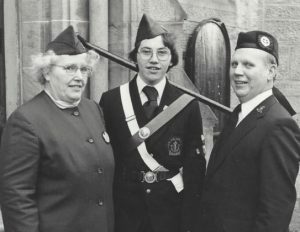 The strands of colour that were woven into the tartan were that of a Christian Family with his fellow BB Officers – his late wife Iris and his son Jimmy; his service in advancing Christ’s Kingdom in and through The Boys’ Brigade; and as a committed member, elder, Clerk to the Board and Session Clerk in Bainsford Church as well as lengthy service as a Presbytery Elder. A further strand of colour in the tartan was Ian’s working life the majority of which was an Inspector with the Royal Society for the Prevention of Cruelty to Children (now Children First). Ian gave freely of himself to the care of children and did so at times in the face of violence towards himself but always put the care of young people to the fore. In Penicuik in 1941, Ian went to join the Cubs! The pack was full so he became a Lifeboy instead beginning a lifelong involvement and commitment to the BB Movement. Church and BB ALWAYS woven together for Ian – Cross and Anchor indivisible. Through shared Church and BB, was how he met and married his dearly loved Iris. When he applied for work with RSSPCC, Ian was clear that it was his BB experience and clear concern for the welfare of young people that meant he was offered the job despite having no formal social work training. Ian loved sharing many happy memories of his life in The Boys’ Brigade. One memory of his boyhood years: Ian was very proud to have taken part as a runner in taking the King’s Message to the 1951 Festival of Britain – a message that started out from Pennyland House in Thurso. After BB Officership in Gorebridge and Penicuik, on the move to Falkirk, Ian served as Officer, Company Section OIC, Captain (17 years) and as an active Honorary Captain of 8th Falkirk. In addition, he was active at Battalion and National Level including Battalion Presidency from 1992 -97. For a number of years he encouraged and maintained standards among boys working for their Queen’s Badge. In Church, he was a lifelong and committed member. He was ordained as an Elder in Penicuik. It was a very proud day for Ian, Iris and Jimmy when Jimmy was ordained an elder on the 25th Anniversary of his own ordination. All of the activities in which Ian participated were done with the very real and active support of a close and loving family. We see a picture of Ian, Iris and Jimmy all in BB uniform and all united in a real and active desire to serve others and in words from the BB Object to advance Christ’s Kingdom. A rich and truly unique tartan representing a man who lived a life of integrity and service and with true compassion for humanity and most especially for young people all based on a faith displayed God’s love. Physical death cannot take that rich legacy, that rich colourful resplendent tartan from us. How can we truly honour his memory and give thanks for all that he gave? – by serving others as he served US and our wider community.